Facilitates revision and exam preparation in this complex area of law. 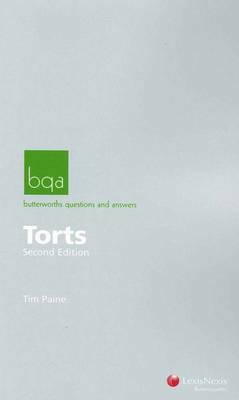 Butterworths Questions & Answers: Torts provides an understanding of tort law and offers a clear and systematic approach to analysing and answering problem and exam questions. Each chapter commences with a summary of relevant cases and identification of the key issues. Each question is followed by a suggested answer plan, a sample answer and comments on how the answer might be viewed by an examiner. The author also offers advice on common errors to avoid and practical hints and tips on how to achieve higher marks.